Successfully Added Anno Domini - Japanese Style Green LED Watch to your Shopping Cart. Introducing the Anno Domini Japanese green LED watch from the year 2911, a period of peace when the world is governed by a cabal of technocrats in the form of 7 hyperintelligent teenage girls, which gives its wearer wizard class hacking skills and massive moxie by refusing to tell time as it's always been told. You mean this watch really tells the time? Yes, even though the Anno Domini embodies Hauru no Ugoku Shiro design and Sen to Chihiro no Kamikakushi style with its neo-gothic numerals and black lacquer flexi-bands which resemble bridge planks, as a metaphor to bridge the gulf that exists between reliance and independence in the lives of teenage girls everywhere, this Japanese green LED watch does in fact tell the time and does so really efficiently too! Tap the single button on the right and watch the screen come to life like a young Japanese girl's face when she spots a bakery selling delicious Taiyaki and feels compelled to scream SUGOI! The upper and lower half of the screen is separated by what looks like a double hyphen "--". In time mode, the numerals above the double hyphen indicate hours while the numerals below display minutes. In date mode, day and month are indicated by the numbers above and below the double hyphen. To change the time or date, simply press the single button and hold for a few seconds upon which the top set of numbers will blink. Change the info with a quick tap and then hold longer to move onto the next item you'd like changed. In fact, when you start wearing this watch, you will be able to channel the powers of the 7 teenage hacker girls. What? You want to know their names and a little about them? I must say, this is hardly the time or place to discuss the names...oh fine, you are the customer after all and the customer is always right. But the story is quite geeky, be warned. Chihiro from Hayao Miyazaki's movie Spirited Away. Leslie Burke from Katherine Paterson's novel Bridge to Terabithia. Yours Truly from Neal Stephenson's novel Snow Crash. Karana from the book Island of the Blue Dolphins by Scott O'Dell. Eveline from James Joyce's short story of the same name. Anne from Lucy Maud Montgomery's Anne of Green Gables. Noomi Rapace and Haley Bennett are said to be Anno Domini owners as are Justin Beiber and Kylie Jenner. In reality this watch is perfect for people who believe Knives Chau should be the next Prime Minister of Canada, yes for your information Canada did have a female PM before and her name was Kim Campbell and so what if she was only in office for 132 days!! !, RIFT players, and anyone who knows the lyrics to Abba's Dancing Queen. The complete lyrics that is and not just the chorus. Just google "Japanese LED Watch" to see how much these timepieces sell for online. Notice how they normally retail for close to 20x the price we're selling them for. Even if you don't intend on buying one for yourself, stock your online store with these headturning watches to lock in some amazing profits! Brought to you by the leader in direct from China wholesale electronics - Chinavasion. Normally sells for around USD200! 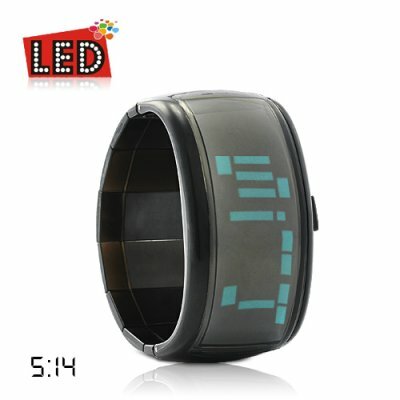 Slip-on Bracelet/Material: Isotopic neo-acrylic polymer from the planet Triacus. If you're looking for the perfect gift for your girlfriend, this is it. Nothing speaks that you celebrate her womanly powers and intelligence than an Anno Domini Japanese Green LED watch. What type of batteries does this watch use? This Green LED watch uses two CR2016 watch batteries and comes pre-installed. Other names this type of battery goes by are button cell, silver button cell, or coin cell batteries. A long, long time! The batteries should last longer than with a normal watch since time and date information is only displayed when need it. You mentioned that this watch is perfect for people who believe Knives Chau should be the next Prime Minister of Canada, Angels Online MMO players, and anyone who knows the lyrics to Abba's Dancing Queen. What if I don't belong to any of these groups? It’s a Ladies watch, and definitely for a small hand and a small wrist. But the item is a great piece. Delivery was in 2days from China to South Africa but I collected the item on the 4th day as I could not get off from work and there was no one at home hence collecting the item. Great item the watch is very stylish and futuristic looking.